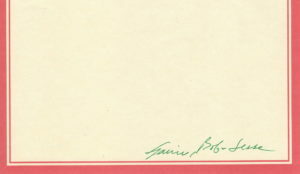 You are currently browsing the archives for the Christmas Cards category. 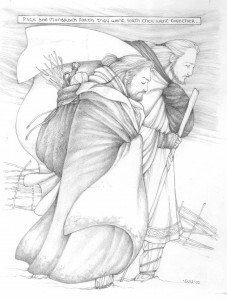 The Klein Family Christmas card, and the subsequent Behind the Art Back Story that always accompanies the illustration, has an actual “story” behind the story of the card. 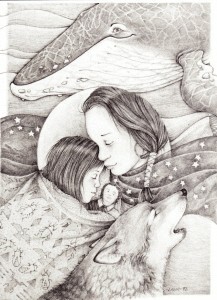 Or, to be more accurate, an original children’s picture book story behind this year’s card. A story that actually began January 29, 2016, when i was invited to do an interview on a local morning TV show and i met a guest that, literally, changed my life. A Pangolin. Instantly i became obsessed with “the most endangered animal no one has ever heard of” and wanted to do something to bring it to broader attention. And i almost had the opportunity in June of 2016 when i received a manuscript that had, as its main character a pig. The nature of the animal had little to do with the actual story so i wrote a proposal suggesting we change the Pig to a Pangolin. The story remained the same, i just thought a Pangolin would give it an added dimension. And i wanted to draw one! get the Go Ahead with no time to do the work. And since things were a little slow (and i’m a bit OCD) i went ahead and did all the rough sketches for the story using my proposed Pangolin character. Then, just to be safe, i did the entire book again using the Pig. Unfortunately, the author made so many contract demands that by December the publisher decided to just cancel the project. But when one book closes another opens. 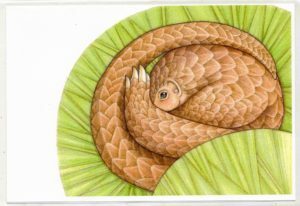 January 2017 the brilliant and talented Lori Schildwachter (who had long become a PangoPal) and i decided to collaborate on our own Pangolin themed children’s book. 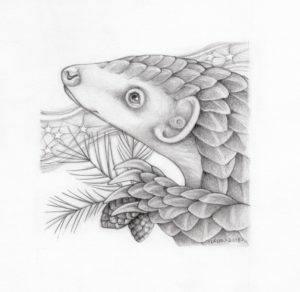 Inspired by a description that suggested a Pangolin was “a cross between a dragon, an artichoke, a pine cone, a tiny dinosaur and an armadillo” A Pangolin Perhaps? was born. So sandwiched between other art & illustration projects (and a hurricane) i began doing the pencil roughs and by the end of the year our book was ready to leave the nest. Our first publisher submissions went out in January of 2018 but even while our little book was making its rounds Lori and i were revising the story, and the illustrations, for submission to the “2018 Key Colours International Award for Best Picture Book Concept” contest held in Belgium in July. I had to redesign the pictures to fit the competition format but actually wound up liking them better and was excited to ship the original pencil sketches off to Europe at the end of June. So, it’s the annual Klein Family Christmas card. I have to admit, after some 40-odd years, coming up with an idea has not always been easy. On more than one occasion i have looked longly at the the Christmas card table on display at Barnes & Noble and thought, “Wouldn’t it be great to just buy some cards this year!” Another alternative idea i have entertained during my occasional Artist Block moments is to do a “Polar Bear In a Blizzard” card (ie: all white, with a black dot in the middle) but, inevitably, the Creative Muse kicks in (not to mention encouraging emails and Facebook messages from friends saying they “can’t wait to see this year’s card”) and personal artistic Pride takes over. Ultimately i wind up getting an idea. Sometimes the theme is an iconic Christmas inspiration like variations of Kris Kringle, or interpretations of classic carols or Charles Dickens’ iconic story. Other times the Christmas illustration is influenced by the year’s current, or on-going, obsessions (sharks, Star Wars, Doctor Who). There’s been a few higher concept/aka:weird ideas (the History of Christmas, quantum physics). And then there are the Family-driven images that feature one of us, or chronicle events of the year (school, the furry kids, flying). This card falls into that latter Family Chronicle category. But it took the entire year to get here, and i only decided that this was indeed the direction to take just before Thanksgiving (hey, these things have to take time to gel). Of course after all that preamble, i feel a little guilty that there isn’t more of a monumental explanatory “Behind the Inspiration” back-story to share. 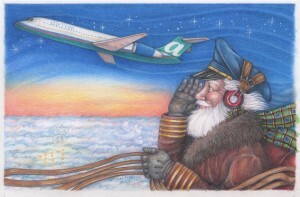 Basically, after a couple-year hiatus from slipping the surly airline bonds, Bob found a new/old flying interest. I say “new” because it’s a new job, but it’s “old” in that BK has returned to his original flying roots (or should that be wings) and gone back to where he started – hauling freight. Way-back-then it was a little Piper Aerostar criss-crossing the US; now it’s the giant MD-11 (Bob affectionally calls it The Beast) criss-crossing the oceans and continents – tooling around Africa, Europe and Asia (tho this month he was all over North America). 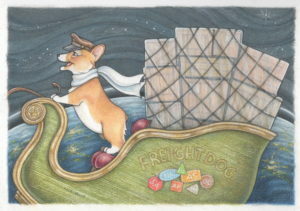 37 years since his cargo days BK is once again a “Freight Dog”. So, naturally, that meant an actual canine needed to serve as pilot. The dilemma was – what kind of canine? I mean, a Corgi was the obvious choice personally, but from an artistic standpoint didn’t seem like the scruffy, junk yard, mutt one would expect with the title. Of course we here at Klein Family Headquarters like to defy expectation and there was simply no other pup who could fill the PIC seat except Tali! 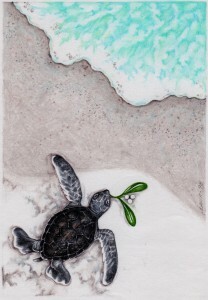 Added bonus – this is also something of a birthday card because she turned 10 years old this month (and she IS a Working Breed) so this card celebrates both Old Dogs and New Beginnings. Besides, who the heck do you think helps Santa get all those packages delivered on time in one night!?! Well, we pulled it off again, Captain. The Cat Was Dead, and Not, To Begin With…..
And Yes. 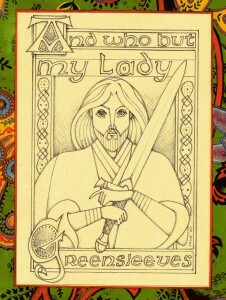 This is what Bob calls one of my “weird” cards (i prefer “high concept”). I am a Dog Person. There is no doubt whatever about that. I am also somewhat obsessed by Time and Space and Physics – when the Universe is faced with “choices” it decides between them at random, in accordance with the laws of probability (quantum theory) and that the choice is not made until somebody looks to see what is going on. The mention of this choice, coupled with the point I started with, must be distinctly understood, or no sense can come of the background story I am going to relate. (NOTE: preamble paraphrase inspired by Charles Dickens). Again, i love dogs. I understand dogs. Over the course of umpteen years i have had the delightful pleasure of sharing different periods of my life with 4 corgis and a wonderful mixed-breed stray, but i have also included the occasional rabbit, hermit crab, fish and hamster to the menagerie (we even took care of a baby bird for a hot second until his mom came and reclaimed him). However, i have never ever wanted, considered or entertained the thought of having a cat. As i often explained to Jess when she was growing up and expressed interest in a kitten, we had the pets I didn’t mind taking care of, so cats simply never made the cut or factored into our lives. Until 4 years ago that is, when Jess, now an adult with a job and apartment, decided to adopt an airport stray and then, 6 months later, promptly moved to Hawaii and dumped the beast in my lap (because Hawaii has strict rules about non-indigenous carnivores devouring their endangered Nene Geese. And no one else would take him). Even when she moved back to the main land she never quite got around to collecting him, so three years later he’s still here. His name is Piper, by the way, but he has also been called: Cat, Booger, Crazy and Monster (not to mention other names inappropriate for a Christmas card story). I should note i knew nothing about cats before i inherited him and 3 years later i am still pretty much in the dark about what makes them tick. Or why people actually like them (particularly given the apparent truth of all the negative Cat Memes on Facebook). They all basically seem to like scratching people (Bob almost had to go to the ER), staring blankly, curling up in boxes, and – particularly annoying for me – inconveniently taking full-body naps on original artwork. 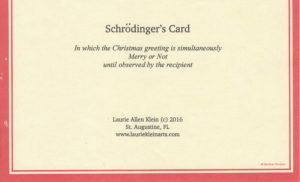 Needless to say, since living with Piper my favorite cat jokes involve Schrodinger in some way, which brings us to the Christmas card back story. Basically – i simply couldn’t think of anything that excited me enough to draw (i blame 2016 as a whole for my ambivalence). And then Piper came to mind and i realized he had not yet been on a family Christmas card so i figured this was really the perfect year to feature him (he did almost kill Bob after all). 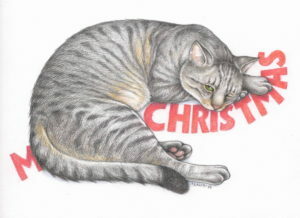 I immediately pictured him sprawled on top of Christmas wrapping because he always lays on my illustrations when he slips past the barricade to my art room (so much so that i once put a piece of paper on the living room floor and wrote “Original Art: Do Not Lay On This” and the minute he saw it he curled up on it and went to sleep). Of course then Schrodinger’s Cat came to mind (bringing the Quantum Physics Lesson above into the mix). Specifically: the thought experiment dreamed up by Erwin Schrodinger involving a CAT, locked in a box with radioactive material, giving it a 50-50 chance of survival. The cat is conceivably both Alive and Dead, the answer unknown, until the observer opens the box (and yes, this is a simplistic, Physics For Dummies interpretation, the true explanation is massively more complex – which is why we have Google). To be honest – i really didn’t know what to draw this year. 2015 was kind of odd in terms of illustration inspiration. Many things happened… just nothing i could really wrap my mind creatively around. That’s when i decided to just keep it simple and celebrate some very special people. Specifically those wonderful, talented, brilliant, caring, generous, dedicated, professionals i have the pleasure to call Friends, and the honor and privilege to call Colleagues. My SeaWorld Family. My SeaWorld Home. It is a place that has been a thread running through my life since i was in high school (i STILL have the pearl i got at the original Pearl Diving pavilion). It was the first theme park we took Jesse to when she was 4 (where she preferred the dolphin stroller to the shows) and in 1995 she went to her first Summer Camp there. Interestingly enough 1995 was the same year Bob and i decided to upheave our lives and started the process of moving to Florida (kind of a fitting, tho unintentional, mirror of life changes that occurred this past year). 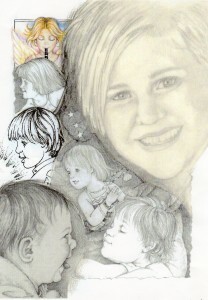 In 1997 i showed my portfolio to the Education Dept. and was given the opportunity to paint an amazing mural (the first one i had ever attempted). And in 1998 i was invited to join this beautiful, magical, inspiring world. A killer whale was the obvious image choice for this card and i reached back to the 1995 Jesse Camp/Christmas card for inspiration. 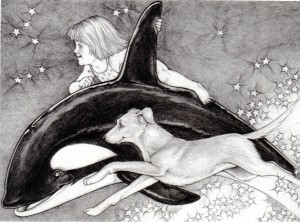 Celebrating Jesse’s camp experience, it was the first time i featured a killer whale, and ironically i only just now realized, as i type, that it was exactly 20 years ago when i drew that first whale, never imagining all the ones to follow. Yet another instance of surprising associations finding their way into my illustrations. I start drawing and next thing you know, i’ve discovered all these unexpected links and connections. All these Threads. For example, i still felt i needed another element to bring this whale idea to Christmas life. 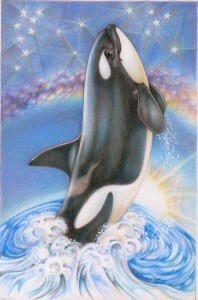 And then i remembered the beautiful song, “Believe”, written for the 2008 killer whale show of the same name. A song, and show, that Jess and i love, and still makes us cry (we have the DVD). Think what a world this world would be… when you BELIEVE!